There has been a lot of concern about litter and dog’s poo in our areas. It is a common problem shared throughout the ages and every corner of the UK and beyond. Solutions are less common, but not impossible. Obviously the onus is on dog owners and individuals to act responsibly, unfortunately that demonstrably fails to address the problem, so what next? 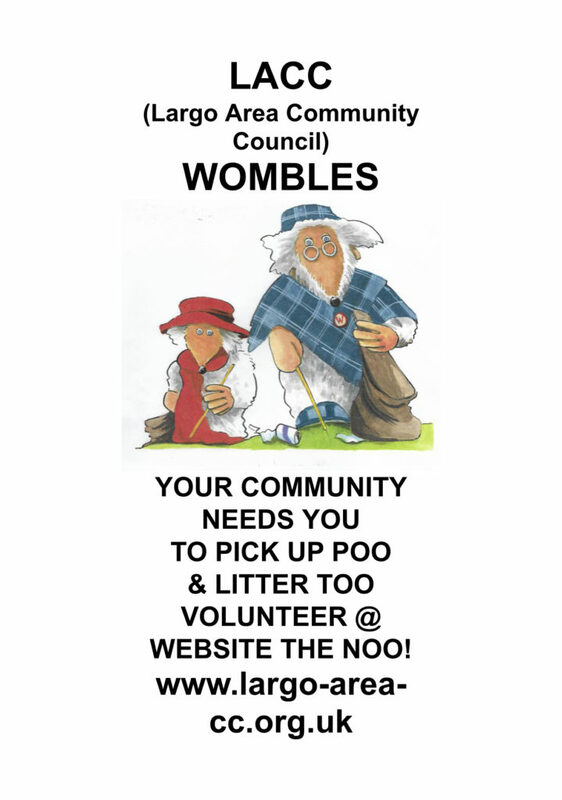 The Community Council has agreed to establish a volunteer Wombles group to help keep up the beautiful appearance of our area, through community engagement and shared responsibility. Fife Council have provided us with litter pickers, gloves and bags and will uplift the results of our efforts. The LACC will provide funds to purchase Hi-Vis vests for volunteers and flyers to highlight the problem and spread awareness. In the same way that small scale vandalism, if left unfixed, can encourage further vandalism, so it is with litter. It is hoped that this initiative will promote community bonding with a visible pride and presence to improve our streets, beaches and parks. It may also be a positive start in educating those responsible and combined with the reporting option, will persuade them that dog fouling and litter is unacceptable. LACC Wombles will be a relaxed and informal meeting of those wishing to help, no-one will be expected to pick up other peoples’ dog mess unless they are ok with that. A willingness to pick up litter is all that is asked of the group. It is expected that we will meet regularly, perhaps once a week or so and we can decide on a different area of a different village each time and welcome suggestions from the community of where to help. Bring your kids, bring your dogs, or just bring yourself – at whichever or every meeting, its completely up to you when and where you attend. If you would like to put your name forward or have any questions, please use the contact form on the website to let us know. A huge thanks to our local artist and satirist Iain Green for donating his time to create the artwork for our flyer!